In any profession, success requires knowledge, tools, and techniques used in the right sequence and at the right time. The preservation of an object – whether a musical instrument or a building – shares creative aspects with the process used to design and create the object, but also has its own set of specialized skills that must be adapted to the project at hand. Anyone trying to shoehorn preservation into a construction mold will not even understand what is possible. Only through an investigative mockup with all parties involved can the potential of the project be unveiled and the team dynamics and ballet of interrelated skills be choreographed to produce the desired goal. 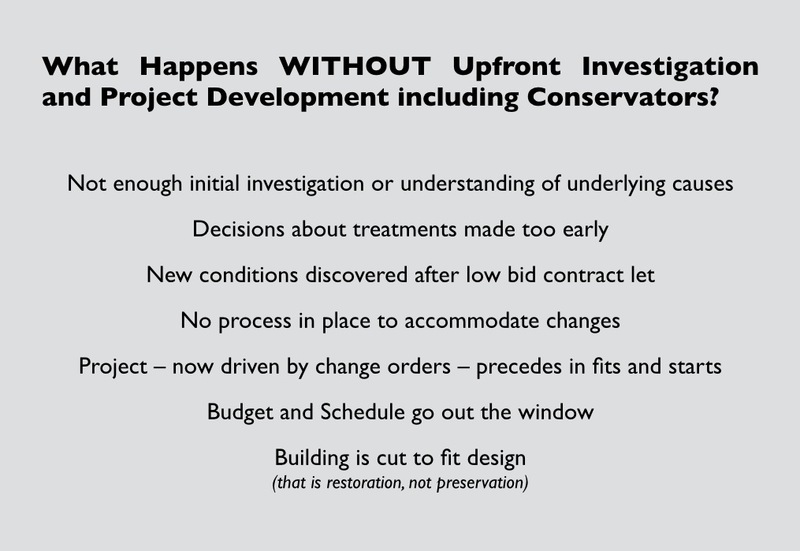 There is a process to conservation that sets it apart from new construction. Failure to recognize the need for this process or to put it into practice wastes time and money, but also can destroy rather than save our heritage as the object is cut to fit a design conceived without an adequate understanding of the challenges ahead. Contractors have said to me that preservation is so expensive and time consuming, and that they could tear down and rebuild the structure from scratch quicker and cheaper than restoring it. I’ve heard this many times. Of course they couldn’t build the same building. They really have no idea how it was put together. That’s usually where the exchange ends: they go back to their linear world of new construction and I back to mine. While their statement bothers me, it does have something interesting behind it: we know more about a building that is yet to be constructed than the building standing in front of us. How can that be? A new building is drawn out in detail, plan views, sections through. Every aspect is already designed, it’s cost known when construction starts. The old building we are standing in front of is not what it seems to our senses. We only see surfaces. Surfaces on top of what? Watching most preservation projects lurch from crisis to standoff while wracking up astronomical change orders justified under the “unknowns” of a preservation project reminds me of using Google Maps with the wrong filter. It would be like getting in your car and keying the directions to your meeting in an hour only to be shown a 17-hour trip. If you were alert, you might recognize you had your route set on walking mode instead of directions by car. 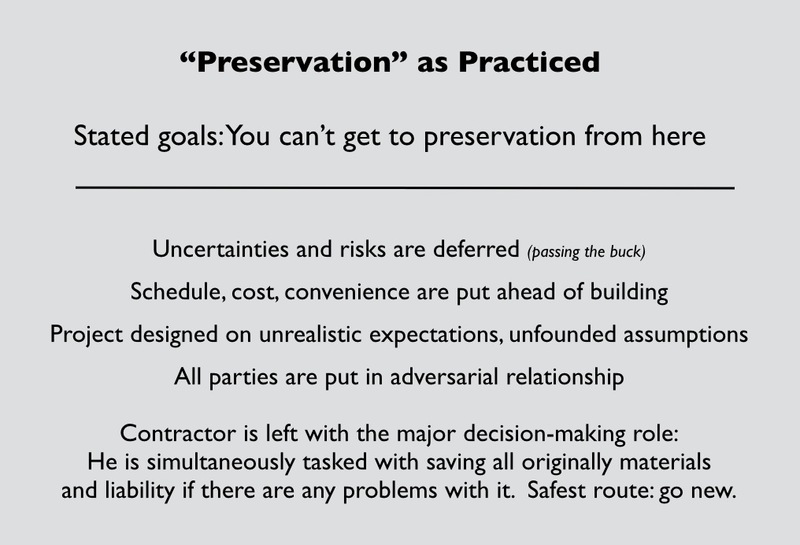 Instead, the common wisdom in preservation these days apparently is to continue on a tortured journey and claim the only way to work on historic buildings is to add at least a 30 to 50% allowance to the budget for “risk mitigation,” rather than question whether the charted route is awry. But there is another way; one that does not use off-the-shelf products and new construction procedures. The right process creates a feedback loop where new information that is discovered while working on the building is able to be woven into the project in real time. 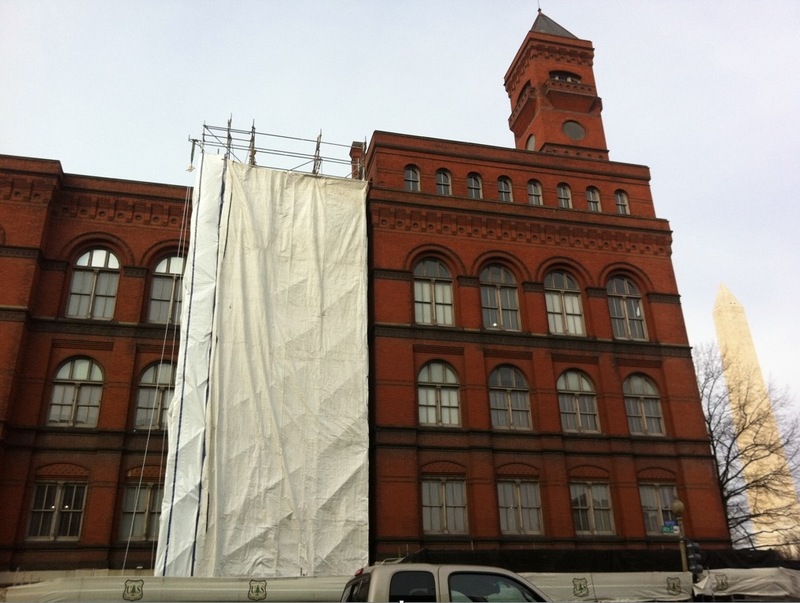 This 1880s building in Washington DC is a good example of a structure that continued to deteriorate for 40 years because each attempt to design a repair plan for it using the standard new-construction-based-restoration process exceeded a reasonable budget. Instead, the on-going leaks were addressed on the interior with regular plaster patching and repainting as water continued to drain in from failing gutters and through the masonry at the projecting bands. Once the client allowed our conservation team to work with contractors in an evolutionary project design process (as a design-build project), we were able to address only those areas that needed repair but give them the best possible treatments. So how did we do it? Based on our best understanding of the building at that point, we estimated how much we thought the client’s budget could reasonably accomplish. The chosen contractor agreed to scaffold as much of the building as we expected could be completed. The primary focus was areas of potential public life safety risk from bricks that were beginning to fall out of the projecting bands and building corners to the sidewalk. It was also agreed to scaffold the tower that had been badly shaken and showed new damage after the earthquake. We were unsure how much repair of the tower could be completed, but we thought the budget could at least cover emergency stabilization. 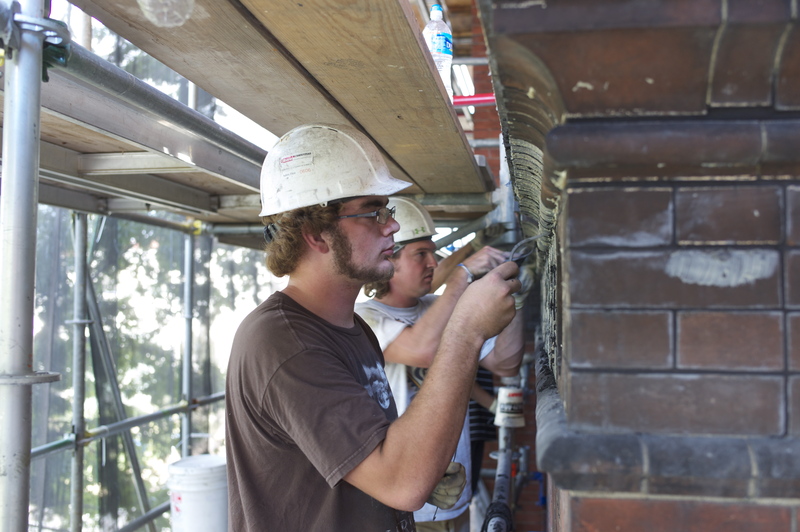 For this month the contractor provided their supervisor for the project, a masonry foreman, two masons and two masonry helpers, and two roofer/metal mechanics to work with the conservators. The “drop” allowed all parties to fully inspect the conditions as they dismantled sections of the gutter and projecting bands to determine construction details, worked out repair protocols, and then developed the necessary tools and mortars to repair the brickwork. 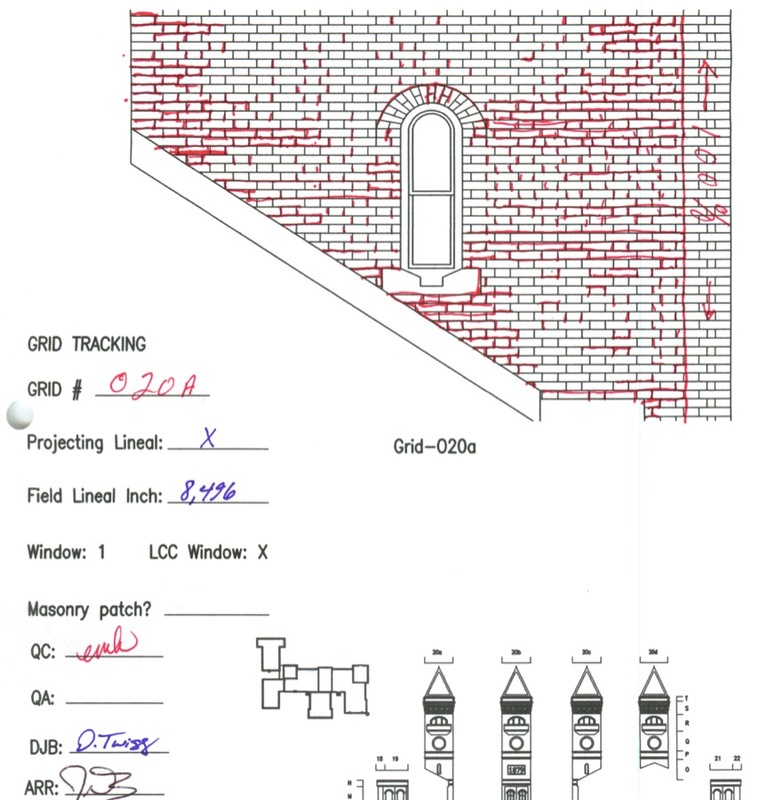 The masonry challenges on this project were particularly acute because the fattest joints might be 3/16-1/4″ but were generally 1/8″, complicating the issues of grouting to fill deep voids. The “drop” period also allowed us to do mockups of alterations to the existing design for the historic preservation office to review and approve. At the end of a month, everyone from the client to the contractor better understood the complexities of the job. At that point the contractor re-bid their labor and materials costs based on agreed-upon field conditions. This included the masons understanding how the work would be laid out for them. 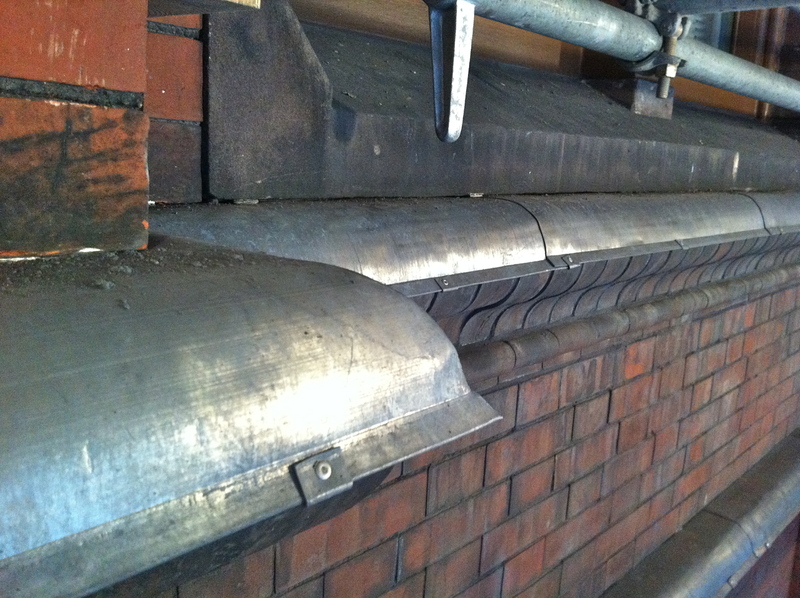 At 189 miles of pointing on the building, a 100% repoint was never going to be fundable and was not necessary. Deteriorated mortar was focused at the projecting bands with their unprotected skyward-facing joints and at building corners, especially those that had been damaged when downspouts built into the walls to drain the gutters had failed. 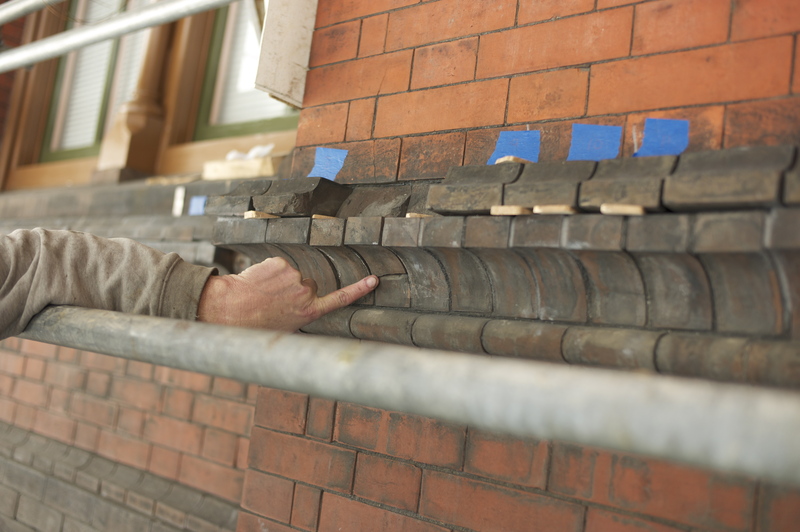 In order to address only those joints that needed repointing, the conservators took a very hands-on approach to laying out the work for the masons. As the A/E and conservator of record, our team went through and marked every inch of joint to be repointed and then totaled the joints with the contractor by building grid. When the grid sheets were completed and totals confirmed by all parties, repointing could begin. In this way only the joints that needed repair were addressed. The conservators worked just ahead of the contractor, determining whether damaged bricks and stone would be replaced or repaired by one of several different methods. Proceeding in this manner, the budget was stretched to complete about 1/3 more of the building than originally envisioned, including complete repairs to the tower, as well as stabilization of 80′ and 150′ retaining walls at sidewalk level that were also becoming unstable. Let’s look at why this building-focused rather than design-focused project worked so well. 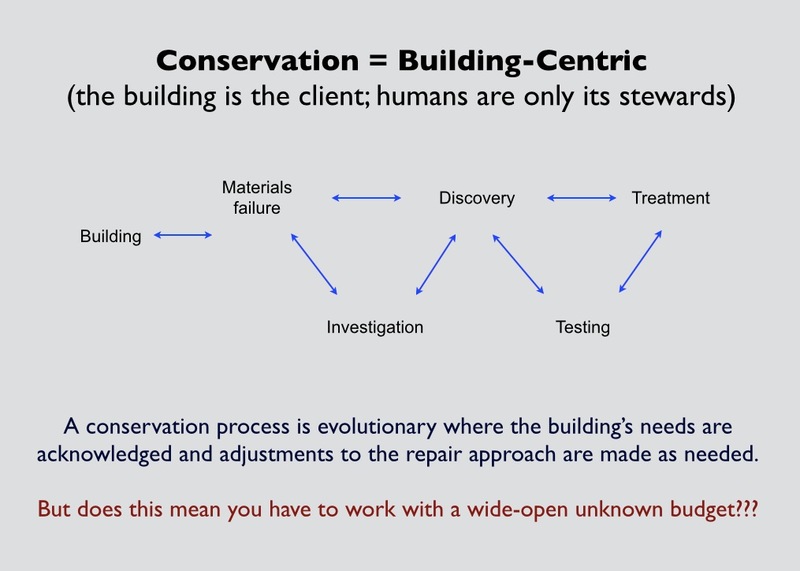 In a nutshell, this graphic describes the evolutionary nature of a process focused on the exact needs of a specific building by incorporating feedback loops that allow conditions to be addressed as they are uncovered during part of the project. This stands in stark contrast to the design-driven process that uses the process of new construction and standard AIA documents. When approached that way, the entire project is guided by documents drafted in an office in the absence of enough information about on-site realities. Of course as soon as this type of project begins, new conditions are uncovered that cannot be accommodated by the design. 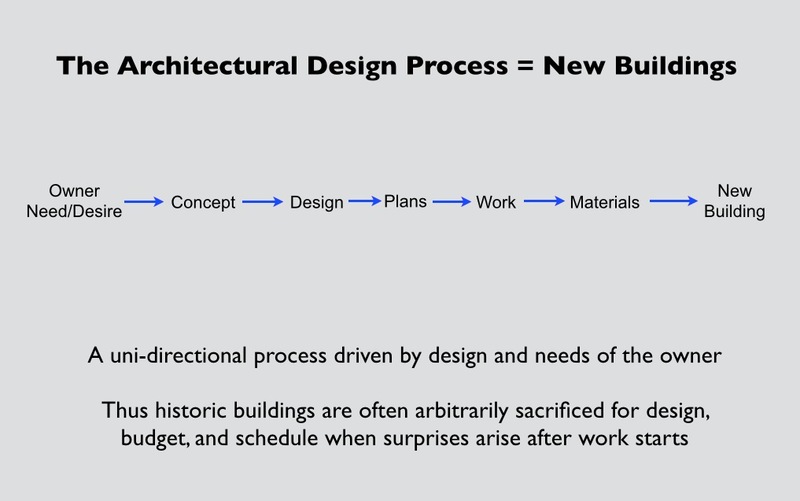 Here’s a way to look at the standard construction process as our historic resources are normally forced through. Repairs that are not necessary are carried out in some areas while areas that really need repair are neglected because they had not been addressed in the original design, either of which is a waste of money and leads to further damage to the historic artifact. Whenever we first suggest using a ‘drop’ process, we hear one of two things. Architects misconstrue the ‘drop’ with the off-site isolated mockups they have contractors do to choose mortar colors and confirm their masons can do neat work. That sort of mockup overlooks the need to determine the needs of the building. People assume that the ‘drop’ is an additional standalone procedure and therefore an extra expense of unknown value that is optional. The fact is that doing a ‘drop’ completes actual work on the building and it ensures the budget is preserved along with the building. One other drawback to having projects designed in an architectural office without the benefit of having conservators work through a ‘drop’ with the chosen contractor is that many in the construction world still fail to recognize that preserving requires different skills than making new things and the skills of preservation are not in the trades. In-kind replication of what existed is not the same as preservation. Why replace what already exists when the original is fully serviceable? Preservation is about saving our past, not trying to mimic it. We can only preserve the past when conservators with laboratory and hand skills are integrated into both project design and contractor training. That can only occur when a ‘drop’ is incorporated from the start. Let’s take another more visual look at how the ‘drop’ can benefit a project by uncovering crucial information in the beginning. This project from the art world helped me to refine the process for the architectural world. In the 1990s, Marigene Butler, head of paintings conservation at the Philadelphia Museum of Art oversaw a project to clean the Landsdowne Room. Working with Ian Bristow and Morgan Phillips, one portion of the room was cleaned to work out the procedures. At the same time, this cleaned area allowed them to show funders what would be gained by the cleaning. Of course, when they started, they thought they were just cleaning fireplace soot and cigar smoke off so the room would not appear dingy. What they uncovered instead surprised everyone. So much for our sepia-toned view of the past! 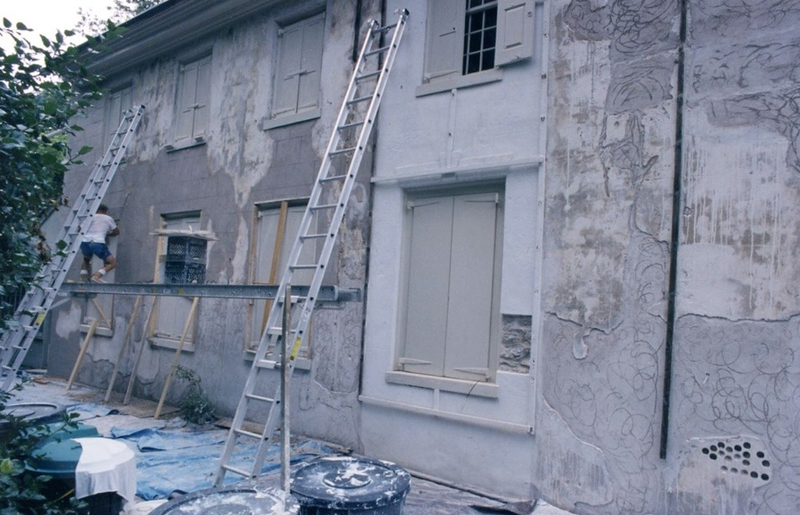 When Marigene was put in charge of the conservation of the Wyck House in Philadelphia a few years later, she encouraged us to take this same approach for repair of a representative section of the building facade. The result was powerful for fundraising purposes at this non-profit. 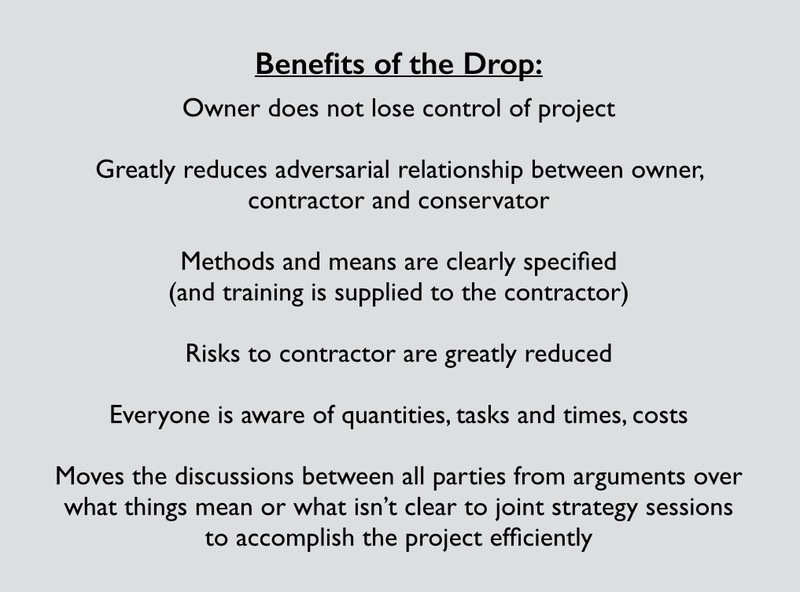 But the benefit of the ‘drop’ is not restricted to helping non-profits who are developing a budget for a future project. It is equally beneficial to projects where a limited budget exists because it prioritizes the money to be spent where it will do the most good. In some ways, it is a further revision of value-engineering a project. 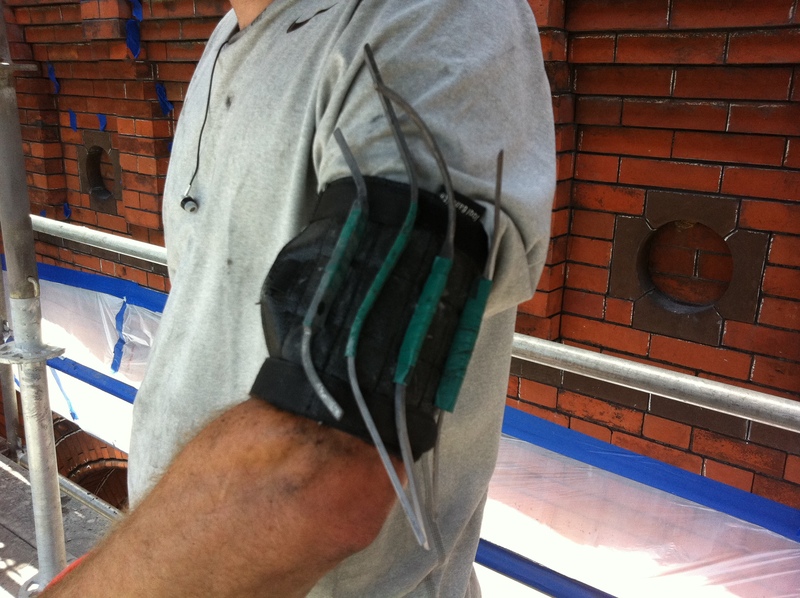 Here, we eliminate wasted effort, make repairs that best match the needs of that exact building so they provide long-term repairs instead of short-term bandaids, and nothing important is missed. 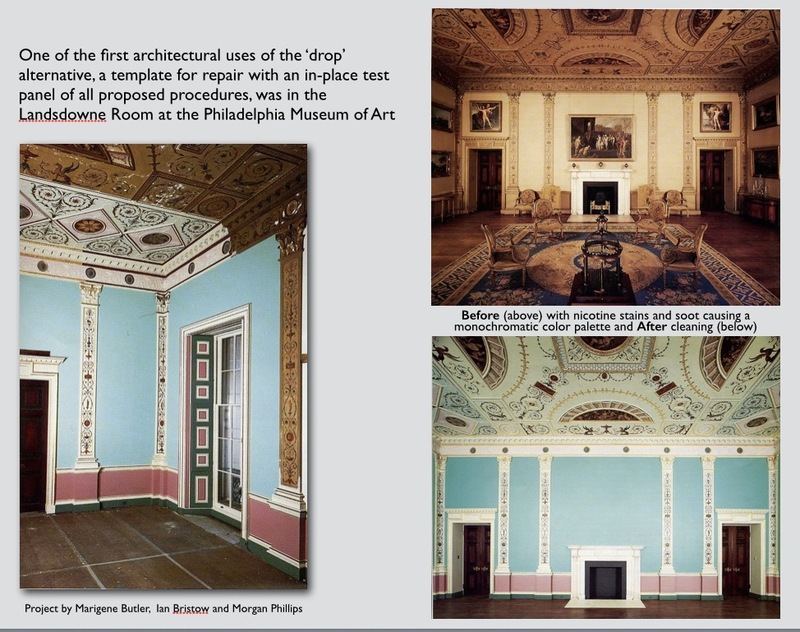 There is a fuller description of the ‘drop’ process here on the preservationscience website as excerpted from my 1995 chapter in Architectural Conservation of the Wyck House: A Building as Museum Object. 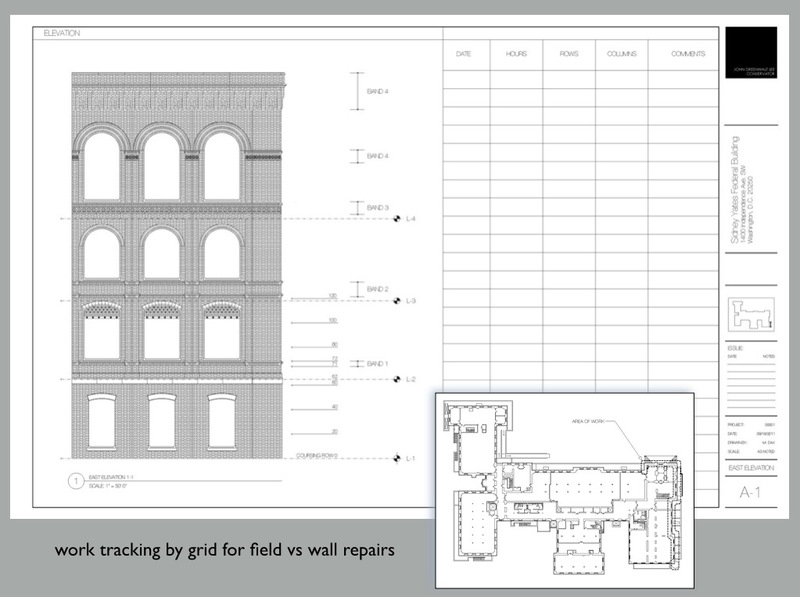 This entry was posted in Masonry Stabilization, Mortars and tagged adaptive management, allowance for preservation, feedback loop, means and methods, project management, risk management for preservation projects, risk mitigation. Bookmark the permalink.